Hotel Inis Oirr – owned and run by the Flaherty family for 25 years. The hotel is situated close to a sandy beach and pier. 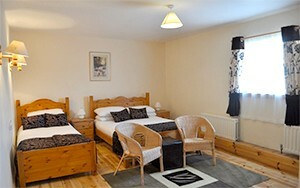 The 14 ensuite bedrooms, including large family rooms, with central heating, electric blankets and hairdryers. The dining room overlooks O’Briens Castle. Day /night menu with fresh local seafood and full wine and bar facilities. There’s a great atmosphere in the bar, with traditional Irish Music and food served.